At the CCDC, the Paulsons are able to provide a number of pediatric orthodontic appliances that can help guide the growth and development of your child’s face, teeth, and bite. With the appliances detailed below, we can ensure that your child has an attractive and well-balanced set of teeth as well as help them avoid the need for more extensive treatments in the future. In the end, they are just another way we can help your child enjoy a lifetime of beautiful smiles. Benefits to palatal (i.e. maxillary) expansion include an increase in arch size, a decrease in dental crowding, bite stabilization, an increase in airway dimension used for breathing, a broader mid-face and smile, and subsequent expansion in the lower arch. Indications for palatal expansion include a posterior crossbite in the transitional dentition (age 7-12), a posterior crossbite with associated mandibular shift (asymmetry) in the primary dentition (4-7 years), moderate to severe upper arch crowding, restricted palatal width due to a thumb habit, and mouth-breathers with a history of snoring/sleep apnea. RPE’s are great appliances and are the most effective appliance for increasing the width of the upper jaw (maxilla) in the transverse dimension. An RPE is most commonly used for patients who have a posterior crossbite. These patients’ upper arches are not wide enough to adequately fit over the their lower arch, so they shift their lower jaw to one side or the other while biting. Usually these patients, prefer shifting to one side or the other and overtime will develop asymmetry of the chin and lower face, excessive wear to their posterior teeth, and possibly a TMJ disorder. An RPE can also be used to alleviate moderate to severe crowding in the upper anterior teeth and also increase airway dimension for patients with ventilation problems due to inadequate airway volume. 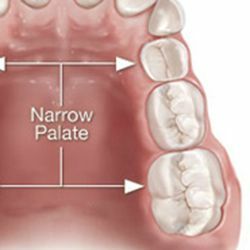 Slow expansion of the upper posterior teeth also creates some expansion of the lower teeth as they lean outwards when bite forces from the expanded upper arch tilt the lower molars. Also, expansion in a child with a deep, overbite can free up the growth of the lower jaw and create a stronger chin and better profile. Expanders are commonly used in patients with a residual thumb habit that has narrowed the width of the palate. 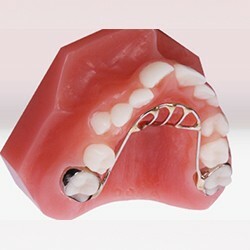 They can even be equipped with features that prevent the patient from placing their thumb in the roof of his/her mouth. Also, they are commonly used in cleft palate patients to promote growth of the midface. An RPE is cemented to the patient’s upper molars and works by placing pressure on the midpalatal suture and increasing its rate of growth. Treatment time with this appliance is usually around 6-10 months. It is most effective at a young age because younger patients’ bone responds more readily to appliance therapy. Also, it is important to achieve expansion of the upper arch prior to eruption of the permanent incisors to alleviate dental crowding and significant rotations in these teeth. 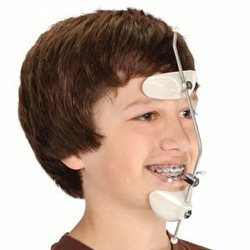 We usually recommend this appliance around the age of 5-6 when the patient has had time to develop our trust and is free from dental anxiety/fear. 1) The Quad-Helix is most beneficial for expansion of the upper canine teeth. Expansion of these teeth allows for greater room in the dental arch for the eruption of the patient’s lateral incisors. Rotation and poor alignment of these teeth is quite common and almost always brought about by a lack of space. 2) The Quad can also increase the width between the patient’s upper molars similar to the type of expansion seen in an RPE. 3) Quads can be used to rotate the upper molars, which can correct some overbite and also increase room in the dental arch. The type of bone growth achieved from the use a quad-helix is different than seen in an expander. Expanders place much more force on the midpalatal suture creating growth in the suture. Quad-helices achieve appositional bone growth secondary to the movement of teeth. So while the quad-helix has superior versatility, the RPE is still the gold standard for achieving greater arch width. Sometimes, the Paulsons will recommend Quad-helix placement after treatment with an expander in order to further promote facial esthetics. The use of a quad-helix is highly effective in altering a tapered, crowded arch into an ovoid, nicely spaced dental arch. The appliance is typically recommended around the age of 7-8, after the eruption of the patient’s maxillary central incisors and 6-year molars, but before the eruption of their lateral incisors. Treatment time is about 6-months. The use of this appliance is highly recommended for those patients looking for straight front teeth and a fuller-looking smile. The class III bite or underbite is a fairly common orthodontic malocclusions (3-5% of the population) and is characterized by the “bulldog” appearance to the lower face/chin. We all probably know someone with the strong chin appearance of an underbite, Jay Leno is a good example. The appearance is actually due to an increase in size of the lower jaw compared to the upper jaw. These patients’ upper front teeth do not normally overlap their lower teeth, so they must shift their jaw forward in order to bite their posterior teeth together. Overtime, class III malocclusion’s tend to cause dysfunction and pain of the temperomanibular joint (TMJ), excess wear and loss of tooth structure to the upper and lower front teeth, and an excessive-looking chin (which is often more concerning for girls than boys). Underbites are best corrected early with the use of an interceptive appliance the Paulsons are highly trained and experienced in using. The reverse-pull facemask works on suture lines in the growing palate much like the RPE does. It promotes anterior growth in the mid-face and is often combined with the use of an RPE if maxillary growth in the transverse dimension is required. 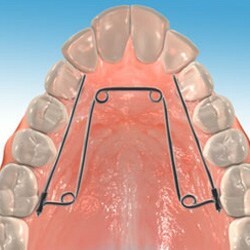 The appliance also functions to gear down the excessive growth of the patient’s lower jaw. The appliance is ominous-looking at first, but the child is not required to wear it to school or in public. The patient is always required to wear the face-mask at night and should understand that the more he/she wears it, the quicker it will work. The appliance is recommended as soon as the patient is old enough to tolerate the impression/cementation procedures and can handle the rigors of having an appliance. Treatment time is usually 8-12 months. Sometimes, certain patients’ growth patterns requires multiple treatments with the face-mask. The Paulsons will monitor each patient’s bite and growth at each check-up and can often reuse the same appliance if necessary. Persistent thumb, pacifier, and bottle habits and abnormal tongue movement can all create adverse orthodontic effects in a growing child. CCDC specializes in working with children and their parents to encourage habit cessation using non-appliance positive reinforcement strategies. If habits persist past the age of 5 and are creating orthodontic problems, we can fabricate a variety of habit cessation appliances. Persistent thumb, bottle, and pacifier habits can all cause narrowing of the maxilla (ie. upper arch) and flaring of the anterior teeth. If corrected early enough, these anatomical changes can be self-correcting. Which is why, our dental lab creates a variety of appliances that can stop your child’s pesky, lingering thumb habit. 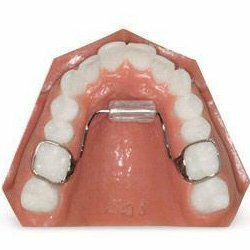 The palatal crib appliances are cemented to the patient’s upper molar teeth and work by preventing the placement of the child’s thumb against his/her palate. Habits usually stop immediately, but children do have a habit of relapsing if removal of the appliance occurs too early. For this reason, average treatment time with this appliance is 6-8 months. The habit appliance can also be combined with a palatal expander (RPE) when palatal expansion is required. 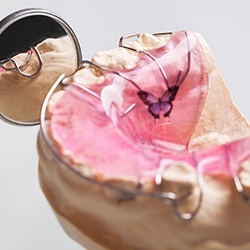 If correction of anterior permanent tooth flaring is desired, appliance and orthodontic therapy with braces can be combined after the completion of the upper incisors root formation (usually around 9). A tongue thrust is a behavior pattern where a child habitually pushes his/her tongue forward during speech, swallowing, and his/her resting posture. Uncorrected tongue thrusting into adulthood can cause dental malocclusion as well as speech and esthetic concerns. Severe tongue thrusters typically present with an anterior open bite, excessive overjet, and at times, a posterior crossbite. A Bluegrass appliance has been shown to assist with tongue thrust correction by re-training the patient’s tongue to position itself high in the palate when resting and swallowing. These appliances can be combined with swallowing therapy to assist in correction of a tongue thrust. The Paulson’s will always refer you to a speech-language pathologist when advised. Casper Children’s Dental Clinic offers treatment with braces for the correction of severely rotated teeth, the ectopic eruption of permanent teeth, and anterior tooth crossbites. Correction of anterior permanent tooth alignment can begin around the age of nine when the root formation of these teeth is completed. 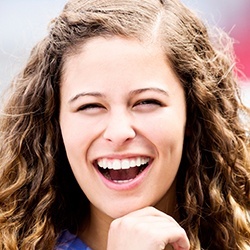 The Paulson’s will recommend treatment that will allow proper arch alignment and to correct dental malocclusions that could cause long-term problems with your child’s teeth. Sometimes, a permanent front tooth will erupt into “crossbite” with its opposing tooth. Anterior crossbites are a dentist’s worst nightmare because they can cause trouble chewing and jaw pain, excess wear on these teeth, asymmetry, and put these teeth at risk of being knocked out from a fall or blow to the chin. CCDC offers retainers with a tiny spring that can correct the harmful crossbite in your child’s front teeth. 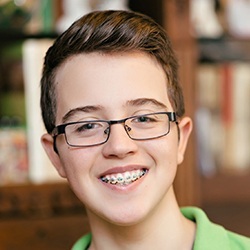 These removable retainers work faster the more your child wears them. 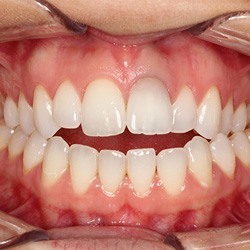 They require simple adjustment once every three weeks and are required only until the crossbite is fixed. Required treatment time is usually around 4 months. Aligners are removable mouth guard-like appliances that help guide the permanent teeth into proper alignment. 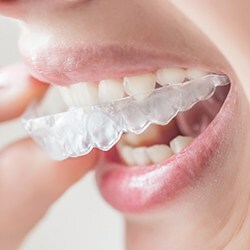 When utilized at the proper time of tooth eruption, aligners can help straighten the teeth and prevent the need for orthodontics in some patients. We also provide limited and full orthodontic treatment with braces. 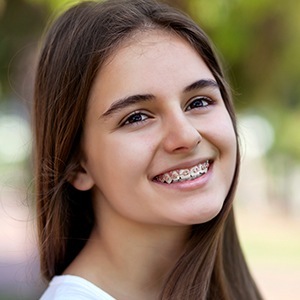 As pediatric dentists we are closely watching the growth and development of your child’s face and will suggest the best possible time for orthodontic intervention to minimize the time required in braces help create your child’s most beautiful smile.